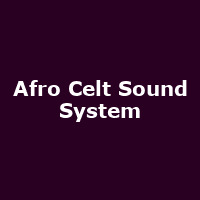 Afro Celt Sound System were formed in 1991 by Grammy-nominated British producer and guitarist, Simon Emmerson (aka Simon Booth). Members have included: N'Faly Kouyate, Iarla O Lionaird, James McNally and Emer Mayock, all playing various instruments from around the world. Emmerson (as Booth) was a member of 70s post-jazz band Weekend and 80s soul-jazz outfit Working Week. The band have recorded for Peter Gabriel's Realworld label since 1995 and have collaborated with a few of its roster. They released their debut album, "Capture" in 1995, followed by: "Volume 1: Sound Magic" (1996), "Volume 2: Release" (1999), "Volume 3: Further in Time" (2001), "Seed" (2003), "Pod (Remix album)" (2004), "Volume 5: Anatomic" (2005), "When You're Falling" featuring Peter Gabriel" (2012), "The Source" (2016), plus 2018's: "Flight". As of 2015, the band split with two bands claiming the name, one fronted by Simon Booth, the other one by James McNally and Martin Russell.